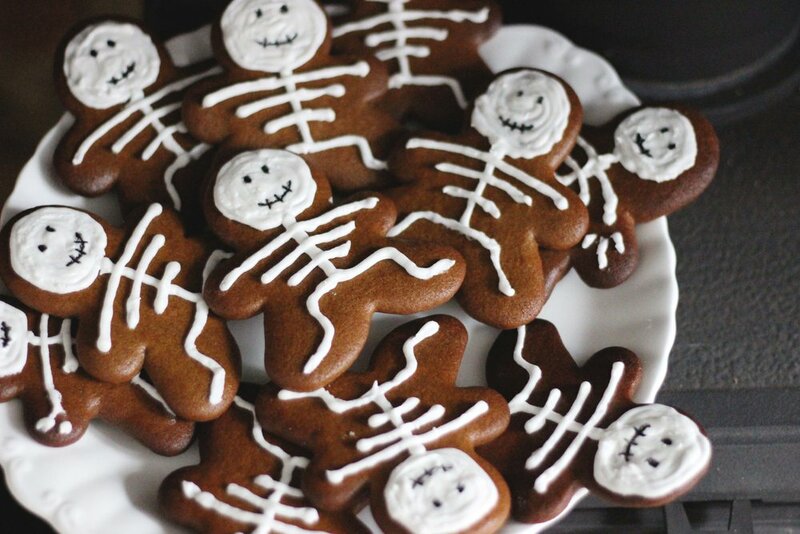 Last Sunday I finally got around to making some spooky bakes. This is something I’ve been thinking about for quite a while, ever since I saw versions of them popping up all over the place this time last year, and finally the time had come to make them a reality. I was going to make them as simple cinnamon biscuits, but unfortunately, I seem to have misplaced my notecard with that particular recipe on it. Instead, I ended up with a classic gingerbread, something I haven’t made for quite a few years. I had to make a few adjustments to the recipe as I didn’t have all of the right ingredients and the cooking time and temperature was all wrong for my oven. A few of them did end up getting a bit singed, but I’d argue that that just makes them even more appropriate for the season. Decorating them was pretty fun, if a bit time consuming, but I was pretty pleased with how they turned out! I know Halloween is tomorrow, (but the spooky season doesn’t really end until fireworks night, right?) but if you want to have a go at some yourself then here’s the recipe I used, very minimally adapted from Olive Magazine. I used a tub of royal icing I got from Waitrose so I didn’t have to faff around with making my own icing with sugar and water, but of course that is a good alternative if you have the time or inclination. Preheat oven to 180C and line two baking sheets with baking parchment or grease thoroughly. Sift and combine the flour, bicarb, salt, ground ginger and cinnamon in a large bowl. Gently heat the butter, sugar, golden syrup and treacle in a pan over a medium heat. Stir frequently to avoid burning the bottom. Add the liquid sugar mixture to the flour and mix it together with a wooden spoon until it’s all combined into a dough. Leave to rest for 15 minutes. Then roll out the dough on a floured surface to a thickness of ½cm. Cut out using your desired cutter, roll up the off-cuts and repeat until all the dough is used. Lay your biscuits on the baking sheets, with a small space between them, they don’t expand that much so can be closer together than cookies. Cook for 7-12 minutes until dark golden brown- they will continue to cook with the residual heat once out of the oven. 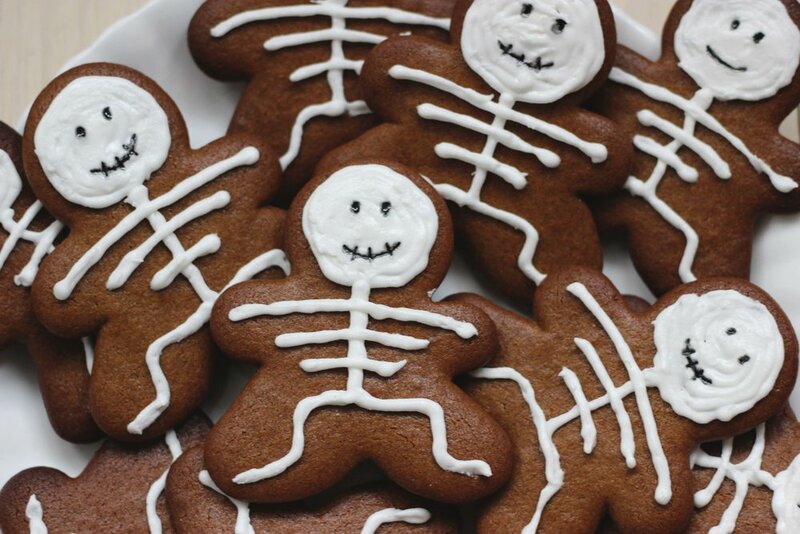 Leave them to cool completely before decorating. Transfer your icing to a piping bag with a thin nossle. If the icing is too solid, warm it up in the bag with your hands until it’s at the desired piping consistency. 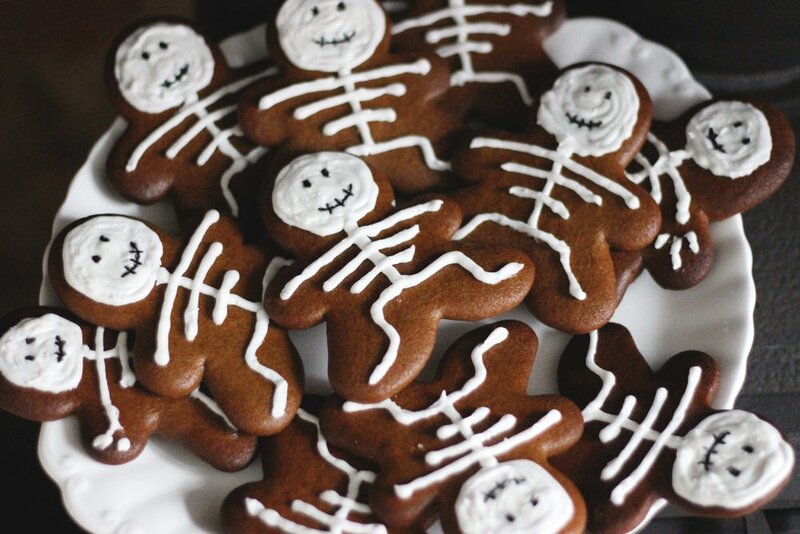 Decorate with your desired skeleton shape. Once the icing is set drip out some black food gel to a plate and use a toothpick to add the face! Enjoy dunked in tea or coffee! 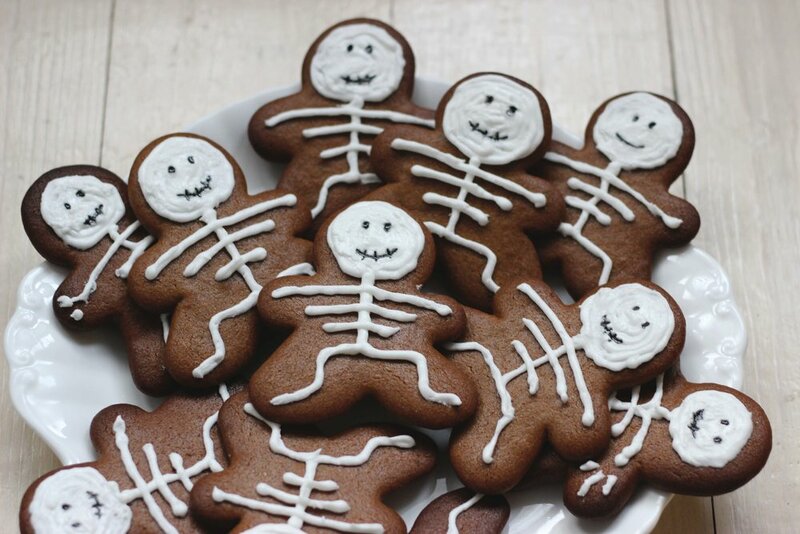 What are your favourite seasonal bakes?